A full day of art activities based around a theme. Workshops run by Andy Leigh. Workshops run from 10.00am - 3.00pm. Bring a packed lunch, and wear suitable clothes. Learn how to Draw Cartoons and Caricatures, and make your own Comic Book to take home. Lots of activities all based around the theme of Time, including Make Your Own Clock (quartz clock movement included). Learn about Roman Pottery, and the Roman’s who lived here on Castle. Includes having a go at using a Potter’s Wheel, and take home a booklet on Roman Northwich. Have a go at lots of different Printing Techniques, including Press Print and Potato Printing. Learn about traditional Canal Boat Decorations and decorate your own wooden spoon and flower pot. Also learn about the lives of the Bargemen who attended the nearby Church. Make a large 3D Relief Picture based on the Holy Trinity Church, plus lots of other arts activities. Roman Pottery Workshop tickets here. Printing Techniques Workshop tickets here. Canal Decoration Workshop tickets here. 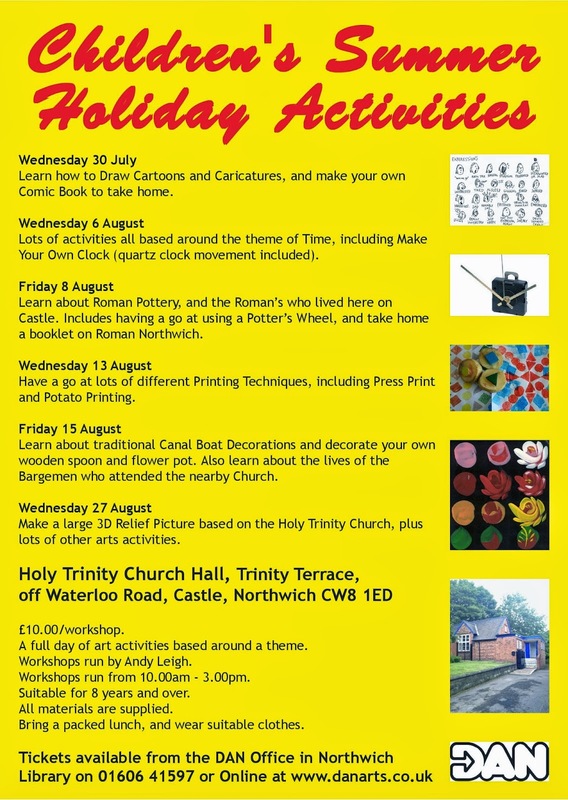 Click here for other ideas for Children's Summer Holiday Activities, including National Trust 50 Thing To Do, Netmums, Mumsnet and DAN's Tourism and Heritage Trail of Northwich.